San Francisco is one of those rare places where, if aliens ever dumped you following an abduction, you would immediately and definitively be able to say “okay, I’m in San Francisco”. From the who’s-who technology showcase of Silicon Valley and precipitous narrow hills of the North Beach area (made famous by the Steve McQueen film Bullitt) to the broad palm-lined streets and bohemian cool of Haight-Ashbury, it’s one of those cities that’s so ingrained into our shared cultural understanding that even going there for the first time feels like coming home. From Chico and Sacramento, we make a point of entering the city via the Golden Gate Bridge. This means a small detour, but it’s the Golden Gate Bridge. We do the tourist thing, of course, peeling off the road before we hit the bridge, to climb up into the hills and get our photographs across the bay. But travelling over the Golden Gate itself is, oddly, more impressive than seeing if from afar; the iconic towers looming before us with their strong fingers of cable, the way the sunlight dances off the water of the bay, and the rolling banks of fog clinging to the bridge’s southern base. I’ve made sure Santana is cued up on my iPod, thankfully. We’re only here for a short time, so are determined to get as much in as we can, starting with another craft beer pioneer: Anchor Steam Brewing. Although the name goes all the way back to 1896, a succession of earthquakes, fires, prohibition and eventually the irresistible rise of cheap lager saw Anchor Steam come within a hair’s breadth of collapse in 1965. This would have been a symbolic blow to the city, even if it hadn’t realised its loss at the time; Anchor Steam was the last of the iconic San Francisco ‘steam beer’ brewers, and a photograph of Joni Mitchell at the original brewery hangs on the tasting room wall. It was (and is) engrained in the city’s culture and history. The big turning point in the brewery’s fortunes came when college graduate Fritz Maytag bought the brewery for a song in the late 60s and set about fixing its many problems. He tackled the beer, refining its recipes and innovating with styles like a porter and – significantly – Liberty Ale, America’s first pale ale dry hopped with all Cascade. He also started bottling and moved the brewery to its current site in an old coffee roastery, which he fitted with a second hand Ziemann brewhouse all the way from Germany. When the new brewery opened its doors in 1979, its sails filled with the first gusts of what would become a storm of craft beer appreciation, and its story has been one of constant and steady growth. 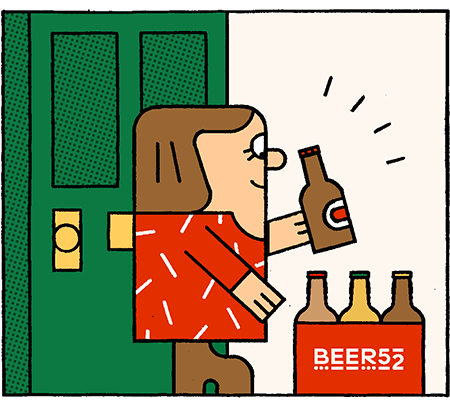 The beers – there are now a dozen in the regular line-up, including ales and lagers – are rock solid, and it’s easy to see their profound influence on the thousands of brewers who have followed in Fritz’s pioneering footsteps. From Anchor Steam, we hop back into the car and over a different bridge, to the super-cool area of downtown Oakland. Oakland has a very different feel to San Francisco; a little edgier and more urban, but with a really strong culture all of its own. We’d had several earnest recommendations to visit The Trappist, a tiny, rustic beer bar opened by Belgophiles Aaron Porter and Chuck Stilphen in 2007. The feel of the place is absolutely spot on and, impressively for a ‘themed’ bar in the middle of the metropolis, doesn’t trip over into kitsch. The selection of beers on tap (and bottle) are impeccable, with the requisite range of continental classics, but also an amazing line-up of Belgian-influenced US breweries, from New Belgium to Allagash (I start with a witbier from the latter, which hits the spot with uncanny precision). Aaron gives us the tour, and the three of us eventually settle in The Trappist’s back room, which is usually opened for busy days and private functions. He’s so enthusiastic about about every beer he brings out for us to try, but reserves his greatest passion for the local breweries turning out sours and wild-fermented Californian brews. Having covered the bar to everyone’s satisfaction, we persuade Aaron to join us for a drink at the notorious Café van Cleef a couple of blocks down the road. With an atmosphere somewhere between a dive bar and a tiki bar, the Van Cleef is quite an experience; most of the illumination comes courtesy of the black lights shining on lurid tiki heads and Hawaiian tat hanging behind the tattoo-festooned barmaid, which is probably a mercy given the sticky floor and teetering tables. In short, I love it and set about working through their limited but pleasing range of local craft beers. The following morning’s journey to our next stop, Firestone Walker in Paso Robles, is quite a haul. This is also probably the most beautiful stretch of coast we’ll travel though, as the Interstate skirts the ocean, occasionally disappearing up into wooded cliff tops. The weather is laying on some drama for us, alternating between brilliant sunshine and dense, tropical-feeling fog, contributing to the increasing feeling that a storm is on its way. As the sun begins to dip lower in the sky, it becomes clear we’re in for one hell of a sunset, so we decide to extend our drive with a diversion along the legendary coastal road through the natural wonder of Big Sur. We hit the section of ragged, rocky coastline at just the right moment, and begin winding our circuitous way up into the cliffs. If you enjoy this kind of driving, it’s a huge pleasure, and we’re soon at the highest point we can reach (part of the coastal road is closed for maintenance). Stepping out of the car on a patch of screed by the roadside, we look out across the Pacific far below. The waves crash almost soundlessly against jagged rocks now wreathed by mist. As the sun finally dips below the horizon, we’re treated to an unforgettable light show, with orange clouds shifting to deep red, onto purple and finally green and blue dazzling off the water.